We're so close to the Biltmore House you can see it from our park. Stay on our BIG, level concrete sites (Free WI-FI) and buy your tickets from us. You'll enjoy the sightseeing and the peace and quiet at the end of the day. Sites in 40s are long term people staying. Very close to your neighbor. Right next to hwy, lots of road noise. No room for a fire and could smell neighbors cigarettes smoke. Great cable TV. Could not get WiFi to work. Had sewer hook up for first time, that was nice. Pool was clean. Bathrooms were clean. This is a great place to stay if you want to explore Ashville and surrounding sites. Very close and easy access to all attractions. Safe and secure place with no gate so you can come in from nightlife at any hour. We stayed here for a week in July. We relied on the Good Sam ratings of 10 when we chose this campground to spend a week. The proximity to Asheville is good. There is not much other camping near the city if you are wanting to tour the city itself, eat in the restaurants, listen to bluegrass, etc. However, not only is this campground over-hyped, so is the city of Asheville. The surrounding countryside is gorgeous and I'd camp away from the city next time to enjoy the beautiful outdoors and skip the whole Asheville thing. That said, the campground itself was nestled on a rise between two busy interstates. Our rig was shaking at times from the vibrations off the freeways. You could hear the noise all day and all night. We did manage to snag one of the few sites with a view which was nice. I used the laundry room and some machines worked better than others. It wasn't great. We did not use restrooms so I can say anything about those. Hookups worked fine. Wifi was a joke. I never once got any internet reception the whole week we were there. Oh yes, on the final night, they broke their own cardinal rule of no late check ins after 10 pm no matter what, even if you have a reservation. At 10:20 pm a huge 45 footer came rumbling in complete with airbrakes and proceeded to spend an hour trying to shoehorn his gigantic rig into a spot meant for a travel trailer. There were 6 good Samaritans out there with flashlights trying to help him. It was actually hilarious and provided some free entertainment on an otherwise dull night. Oh yes, we will never stay here again. I'm sorry but this RV park does not live up to it's advertised marketing. The ONLY good point was the ease of backing in to our site. Firstly, however of all the many RV Parks we've stayed at across the world we've never been to one where the swimming pool is only open during office hours (ie 9am -5pm). So if after a hard days drive to get here you'd like a swim and it's after 5pm, forget it! Second, the facilities were difficult for us to get to. Either a long walk or a steep climb to either of the nearest restroom/showers. Add to that my wife refused to use them after our 2nd day here as the ladies shower cubicles were flooded (again) and full of caterpillars. Thirdly, I know nothing of the secrets of a laundry but my wife used two washing machines and two dryers to do our laundry which took her over 4 hours! She tells me the dryers were next to hopeless. Finally, forget the internet. I have years of IT training and my guess is they have bought and installed the cheapest 'home' modem they could find just so they can advertise they have wifi. Despite the staff's rubbish claims of us being too far from the modem we had a full 4 bars, "Excellent" reception on our laptops and mobile phones but NO INTERNET. This generally indicates a small modem with insufficient 'slots' to cater for more than a few people at a time. (Hence when someone did get hooked up they wouldn't log off.) The staff's "couldn't give a ....." attitude was the final straw. We leave tomorrow and will never be back. P.S. I spoke with several other campers and these sentiments were echoed by each and everyone of them. Great location and amazing views. Hilly location with the majority of the sites are back in sites and are narrow. Neighbors are very close. Some sites the power, waste and water are in the very back of the site. Main restrooms and showers below the office are very small and be prepared for wet floors. The pool is nice but it is only open during the office hours. Interstate 40 travels right along the south border of the property. You hear the noise even though you are on a hill. The owner and staff are great. My wife and I stayed at Bear Creek in early April on our way back north after wintering in Florida. We were given a upper level back in site. We were up high and had a great view from the back of our site. The site was easy to back into and level. All hook ups worked very well. We did not use restrooms so I could not tell you anything about them. The campground was easy to find with our Good Sam GPS. We did have to unhook on a slight slope toward the back of the car, but managed well. To hook up the next morning I pulled to the top of the hill and found a nice level area just before the exit. I would stay there again and plan to go to see the sites in Ashville. It's hard to believe this place is full in the middle of November, but definitely shows the lack of options in the area. There are nicer areas of the park, but we were pinned in a tiny site, barely able to extend the slide, and 10' away from the main road. The shower facilities were outdated with the showers being hard to manage. How hard is it to put a full sized shower curtain up to prevent water from getting all over the floor and my stuff? On top of it, in my opinion the place is priced higher than average. If we do come through here next time, I'll make sure it's not here. We love Asheville, but not enough to stay at Bear Creek RV Park again. Judging by the difficulty in getting a decent campsite, Asheville, NC is a very popular place. To date, camping here has not been a good experience. 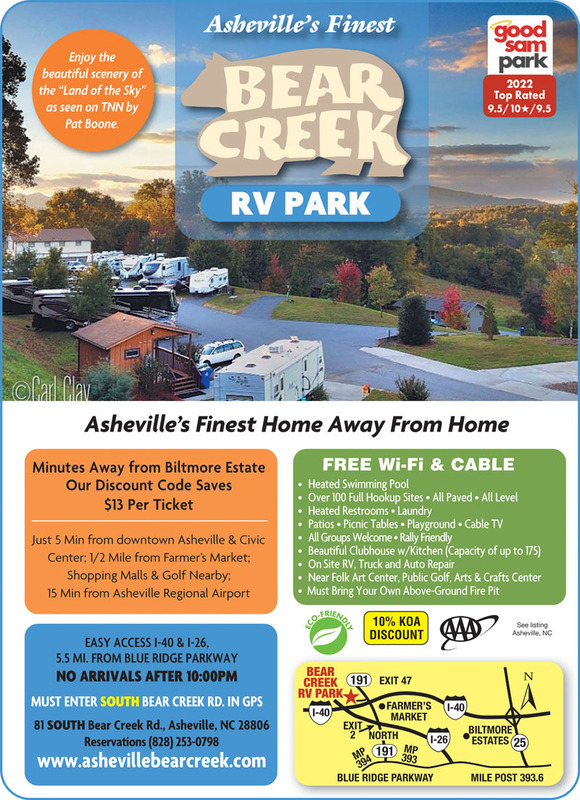 Add Bear Creek RV Park to the list of overpriced, apathetic businesses who appear to over-represent themselves to transient travelers for their existence, because they are acutely aware of the limited campsite availability in Asheville. PROS: - Location. - The site we were on was somewhat level. CONS: - You know what they say about first impressions... Ours was of the sad, humorless, yet efficient, woman who registered us. Her apathetic demeanor was a portent of our experience at Bear Creek RV Park. - Their website touts the view from their campsites, and their proximity to Biltmore Estates. We have zero interest in the usual tourist traps, and our view was of the park office, the interstate, and the driveways of the residences of the park owners. Of course, we paid the same rates as those few who actually had a view. - NOISY. Our site was nestled between Interstate 40, and I-240/26. Normal conversation outside was difficult because of the stereo Jake braking of trucks on the downhill stretches of the interstate. - The WiFi sucked. Having camped at hundreds of campgrounds, we are aware of the practice of advertising "complimentary" internet. They don't intentionally include in the price of the site because they don't want to be held accountable for the terrible performance of the service. This is obviously the case here, as we were barely able to download simple emails. The WiFi signal was strong, but the internet service was consistently bad regardless of the time of day. - Cable TV. Same as above. The standard definition of the analog system was barely watchable. - The bathrooms were well below average. However, they were reasonably clean for, what appeared to be, 20+ year old plumbing fixtures. BOTTOM LINE: We will never stay there again. It was definitely not worth the money. Worst RV park, private or chain we have ever stayed at! Bathrooms are deplorable, the pull-through site is so tight it is a chore to get into the site, internet is close to unusable, employee at the desk is not sociable or helpful, the park is old, crowed and unkempt. Site was within feet of a major highway with no barrier. I would not stay there again if it were free! Stayed here one night to be close to Asheville. Not sure how this can be rated 10s. It is very convenient. Staff was nice to us but clearly busy and a bit overwhelmed. Pull throughs sometimes are small and difficult to get into. It is a very busy place. There isn't much there except close to Asheville. Ignore the Good Sam ratings for this park, I can't understand why they are so high. This park is way way below average, we needed a overnight in this area and I picked it based on the Good Sam ratings, big mistake!! Please everyone read the individual reviews, I did not and severely regret it. For $45.00 we got a "pull through" site sandwiched between I-40 to our rear and a two lane county road 30' from our front grill. The site is very narrow, we can't put out our living room slide on the drivers side because of a sewer vent pipe 8 feet in height. the neighboring concrete pad is about 4 feet from our steps and the sewer connect for that site is about two feet from our lower step. Fortunately no one is parked there yet. The park is built on a hillside in a hodge-podge manner to maximize spaces with no thought to an enjoyable stay by the customer. The spaces on either side of us are 50 amp and ours is 30 amp for some reason which wasn't disclosed on check-in. On a positive note the wi-fi works pretty good and I am using it to post this review. My wife and I have stayed in over 50 parks in the last year and half, this park rates in the bottom 3.
this campground is totally overrated by Good Sams. Sites are helter skelter and interior roadway is rough, hard to turn in to site with a big rig. We lost power at our pedestal twice during our stay, and we were the only site affected. Both times was "after hours" with no maintenance man on site. Luckily, the power returned about 20 minutes later. To access pull through sites, you have to go farther down the road to another entrance, which was very confusing at check-in. Sites are right next to the highway, so you have a lot of road noise. It is convenient to various activities in Asheville. I do not plan on returning to this campground; I will search out another park on my next visit. Nice park with level sites. The staff were very friendly and accommodating. We enjoyed our stay. What makes this park appealing is it's proximity to Asheville. It's noisy because it is right next to the freeway but we didn't go there to sit around the park so the noise didn't bother us. The wifi wasn't very good. The park is old but very well maintained. The site we had was a pull through and was big enough for our 35' MH and car dolly. Worst RV park! DO NOT STAY HERE!!!! Extremely small sites, extremely rude staff, extremely loud highway noise. You would be much better off staying at a state campground. Thought would be a great park with the Good Sam ratings we saw. Spaces way too small, uninviting pool. Laundry room dirty. Check in gal not at all friendly. Lots of road noise and entrance to park very dangerous. Would not go back. This is a very old campground. Sites are very close together and some of them should not be sites at all. I had to throw my electrical cord under my RV to plug it in on the other side of my hook ups. Site was uneven. Bathroom and shower are very old and shower curtain had holes and mold on it. Entryway and roads are very narrow and hard to navigate. Had a hard time finding my site. Site is 5 feet from the maintenance/apartment's building. Shouldn't be a site. Staff was friendly. This should not be rated 10. I've been in a 10 and at most it's a 5. We camp mostly at Good Sam reviewed campgrounds but this one was very disappointing - sites are literally between two roads (a major interstate and two lane local road) you are only a few steps from your site and in the middle of the two lane road - the sites are terrible - when we stepped out our door we had to be careful not to fall over the sewer and water connections or bump into the pole with electrical connection and thank goodness it wasn't crowded or the other campers would have been just steps away - we were also witness to the desk clerk being extremely nasty to incoming campers regarding the time of their arrival - could have been handled better - the only redeeming fact is that yes, they are conveniently located within minutes of the Biltmore Estate. Our stay at Bear Creek was not enjoyable. Our trailer and truck would NOT FIT on our site. When we checked in we asked how long the site was, and we told the check in lady that our truck and trailer would not fit--where would we park our truck. She sullenly explained that there was 'parking all around' to park the truck, and that was the only site open for the weekend, she couldn't move us to another site. It was was ridiculous. Our truck stuck out in the road, while we were setting up and unhooking. There's barely a view. Internet was just OK, not consistent. Can't comment about bathhouses or pool. The main road is narrow, every site is small, and at most sites, there is not room to park a trailer and a truck. Everyone had to park on the main road, and that doesn't leave room for big rigs to pass. We will not return. The pictures on the campground website are very deceiving. Only a couple of sites have great views, the rest of the sites have no views. As for the sites they are just too small, and very cramped. The site we had and many others like it have the picnic table placed right next to the adjacent sites hook ups including the black water. Local ordinance also states that you can not have a wood burning fire unless you have a pit that is off the ground. They do not supply the pit. I am unable to provide a review of the pool, bathrooms, and WIFI as I did not use any of these. The campground is situated in between two major highways. I expected noise and there was plenty of it. I will not be returning to this campground. If you are looking for a spot to just park and sleep, then this is it. I would not call this camping. The ratings by goodsam are just a bit too high. Good Sam ratings for this park are misleading to say the least. The sites are extremely close to each other. This is a very noisy park. Sites are adjacent to busy interstate and placement on high plateau above highway seems to magnify the truck noise which goes on day and night. We paid for a week and left early to get some rest elsewhere. I will say the staff was pleasant and helpful. Would have asked to move to a quieter site but they are all backed up to busy roadways. Restrooms are in need of serious repair. The dog walk is adjacent to I-40 and the extreme noise was upsetting for the dogs. Other campers were not picking up after their dogs which is not the fault of the park but perhaps this should be stressed at checkin. I will never spend another night in this campground and could not recommend to anyone unless they are totally deaf and not traveling with pets. 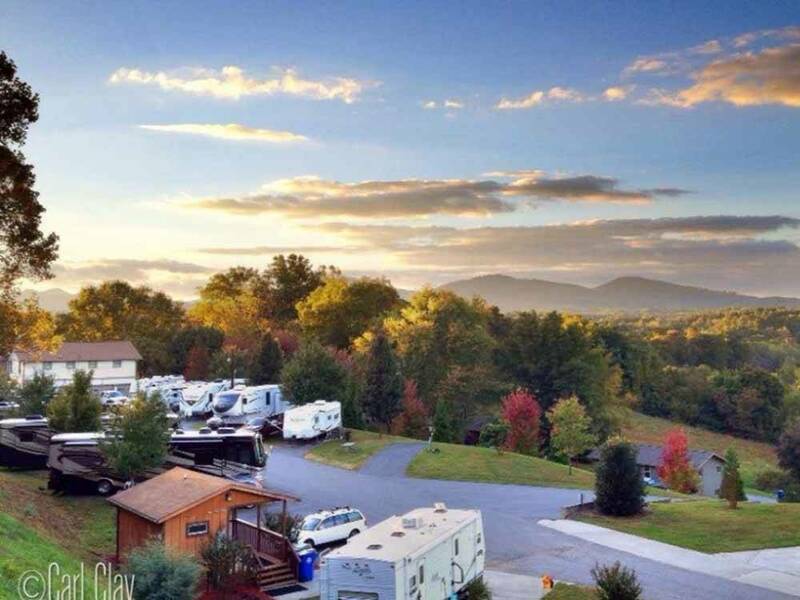 This campground is conveniently located to visit Asheville and the Biltmore Estate. It has an odd arrangement of sites but it works. They have a pool but we didn’t use it, the free WiFi worked well but was intermittently out of service. The driveways are asphalt and site pads are concrete. We were in a pull through that was somewhat short and narrow (Site 12B). It was near the road and you can hear interstate traffic on the other side but this did not disturb our sleep. The bathrooms were consistently clean. We used their cable service which has an extensive channel selection and worked well. We had a full hookup site with 30amp electric. We paid $40.00 per night. We came to Asheville to attend a wedding, so being near the city was preferred. We also wanted to rent a car as we do not tow a vehicle. Making a reservation was easy. Too easy. I can only assume I made a mistake and we arrived a day early, and after hours. Being new to RVing we failed to look at the bulletin board outside the office....... This could have been avoided with email confirmation. Staff was firm but fair about the mistake, and we learned something in the process. I'll review only what we saw/used. Where we stayed we pointed toward the road the RV Park is on, and the interstate highway was behind us. Not ideal, but it worked. Spots were paved and fairly level. The water in the shower pan said we were tilting back and a little right. Our spot had 50/30 amp, H2O, sewer, cable and wifi. We did not use the cable, the wifi was fair. There is a sign in the office that says wifi was not meant for streaming movies. There is a pool. We didn't use it, and didn't see anybody else using it. But, it looked inviting. The office was knowledgable about activities around Asheville, and sold tickets to Biltmore. Our dogs liked the dog walk area. Lots of good smells there, and everybody seemed to clean up after their dogs. We got a car from Enterprise. It's been a while since renting from them. I give them 10/10. They also showed us a good way to get downtown. If I come back to Asheville, I would stay here again. Its proximity to the highway is not the best, but it's not a deal breaker either. We used the high rating of the Good Sam website to select this campground and were expecting a good experience, but this was one of the worst places we've stayed. We had called ahead to reserve a pull-thru site, but when we got there, they tried to put us in a back-in site. Turns out they had given the site they reserved for us to someone else. When we told them we specifically had requested pull-thru, they then put us in a site that we couldn't get into in our 35' motorhome. So we just went further until we found a site we COULD get into that they had also mentioned to us. It was so narrow that we were unable to open our awning, as it hung over the site next to us! The concrete pad was not in good condition either. The bathrooms were very small. My shower curtain had a tear in it that I had to use my t-shirt to obtain privacy in the shower. Also, difficult to regulate the water in the shower. Any time anyone else used the water or flushed a toilet you had to be careful not to get burned or frozen by water too hot or too cold. This felt like a place where they were using every spare inch of space to crowd you in to get the most money. The only appeal we can think of is that this campground is in Asheville and not far off I-40, but if we go to Asheville again, we will go out of our way to find another place to stay! Beautiful campground and very helpful staff. Spaces were large and level, pool looked great (rainy). Road to/from is steep (as is the rest of the region). I HONESTLY think the ratings are WAY TOO HIGH for this "park." The sites are so very, VERY narrow. Our neighbor's picnic table was practically hitting our slide out. To me, this is just a place to PARK your RV and sleep if you plan on doing Asheville during the day. You can't build fires, and there is no real privacy to "hang out" on your site. And even if there was, there is *no room. * The bathrooms are NOT a 10. broken tiles, and holes in the shower walls are not a 10, in my opinion. It isn't newer. The lady at the office was very, very nice. Our concrete pad looked like it had be jackhammered. Seriously, the concrete was broken with a lot of dangerous pieces sticking up 3-4 inches. There are NO lights in the park, so tripping over the concrete slabs sticking up was a concern. Some sites have been paved with blacktop (our friend's was) and are fine. It really IS between two highways, and it IS noisy, but nothing woke me up out of my sleep. So, that wasn't such a huge issue. The location is pretty great as far as campgrounds go close to Asheville. We took Uber into town. The spots are so small and narrow, that if there are people in front of you, they almost have to park in the road, which made it had for our friends to back their 30 foot travel trailer. It was a bit difficult for our littler 21 footer! I don't think I'd stay here again. But we were LITERALLY there to just sleep, so the $40 a night fee wasn't bad at all. Showers were far from a 10*. They were roomy, but shower heads were in an odd location and you had to use zen to determine where the location was for hot water. Site was very cramped and littered. Cable was on and off, but never the campgrounds fault. Staff/owner was friendly, but office was left vacant two out of three times we needed something and phone calls for reservations were not returned. They advertise "Biltmore View," but that must be when all the leaves are off the trees. We probably would not go back again. The spaces are very small, we camped across from a house and garage. My truck seemed like it was out in the road, very narrow drives. Had a beautiful view of the Biltmore property across the interstate. restrooms were so-so, Staff was friendly and helpful. Not a lot for children to do. We spent a few days here and it was alright, but I would not have wanted to stay longer. The 10 rating for the bathroom is extremely misleading. Not sure who rates this campground, but I would put it more around a 5. The bath house on the lower level had 2 unisex bathrooms that consisted of one toilet and one shower. They were old and not really dirty, but not really clean. I have a family of 4 and there was not enough hot water for all of us to take showers back to back. The campground was mostly empty while we were there, so I could not imagine how the bathrooms would service a full campground. The sites are tight and close to the highway with all the noise that comes with it, but it is convenient to Asheville and the Biltmore Estate. If bathrooms are not important and you like the convenience of a good location then I would recommend this campground for you. But if bathrooms and space is important, I would not recommend it for you. Just too crowded. Had I known how small the sites were and that I was going to be parked 50 feet from a busy highway I would have looked elsewhere. There is a dog walking area with no bags or disposal, just a lawn area at the end of the park next to a busy road. The staff was very nice and helpful. Location is ideal for getting around Asheville and surrounding attractions. Forget about using the laundry room, equipment in need of repair or replacement and no ventilation. Just too crowded. Had I known how small the sites were and that I was going to be parked 30 feet from a busy highway I would have looked elsewhere. While the location is very good for accessing the Asheville area, the facilities are a bit run down and the sites are very close together. We had a big rig coming in after dark hit our car while trying to back into their site, our car was well off the road, just a very narrow road for big rigs to maneuver and it is very dark, no lighting. The staff was very nice as were the other travelers but can only rate as 3 stars. The campground was on a narrow winding road and close to the highway. It was all paved with a small grassy area and no fires allowed. We were camping in the owners yard next to his garage. The area was clean with pleasant staff. The space was tiny and not shaded on the lower level.There were no place to take a walk..It was not a good place for our dog. Campground is clean, staff helpful and friendly. Didn't use showers and the pool was closed since we stayed late season. Location is ideal for getting around Asheville and surrounding attractions but it comes at the cost of being between two highways. A lot of traffic noise 24 hrs a day. Wifi worked ok but was nearly impossible to use during evening hours. There is a dog walking area with no bags or disposal, just a lawn area at the end of the park next to a busy road. A fenced dog run would go a long way here. I agree, the high Good Sam rating is not fair to other highly rated parks that deserve a high rating. What I liked: Great help at the desk. Very knowledge of the area. Preprinted maps and instructions. Reservations were quick and the staff is very professional at the desk and phone. Obviously a lot of experience with campers. I liked the easy pull through. Sort of level. Paved cement. Ashville has no flat spots so be prepared to work your jacks. Full hookup was a cinch. The place was clean for a high traffic campground. I liked the trash barrels near the campers. They have a good cable tv network. The Wi-Fi worked well for us. I liked how close we were to the Ashville area stuff. What I did not like: The ratings on Good Sam 10-10-10 is over rated. The truck noise is heavy with jake brakes and lots of tire noise. The bathrooms and showers were just ok, not a 10. When we first arrived, it was hot and humid. So were the bathrooms. Later after it cooled down they were better. Our pull through put our rv nose near a turn on a busy country road. We were only a few feet from this road with no fence. This made my wife nervous. I did not like the dog doo on the grass near our camper. Shame on the dog owner who did not clean up. I did not like not having a fire ring. We actually were right on a rode and heard the interstate traffic behind us. The internet did not work at all. The office staff was friendly and helpful. Sites were flat. Pleasant stay until next to last day. Early arrival of another camper caused office to double up the space we were assigned. Not a good fix as it cramped both parties and caused friction. We have stayed at a 10,10,10 parks, and it is not fair to them to rate this one that high. Showers were old and grout not clean. No hot water in showers either of 3 days and no air in showers. Sites were extremely small. Lots of noise from highway. Wifi didn't work for us anytime. We were told it gets too many people on it, but they only have 100 sites. Did not have pick-up bags for dogs. Pool seemed clean and staff was friendly. Liked that they had recycle bins along with trash bins. Location wise it is very convenient. Campers were friendly.